World Of MY Little Pony! My Little Pony line produced by Hasbro. 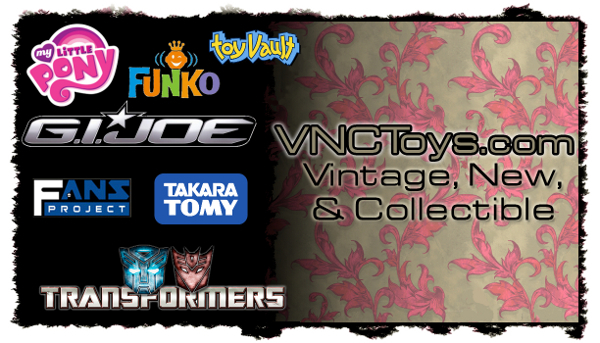 and other collectible toys for sale! 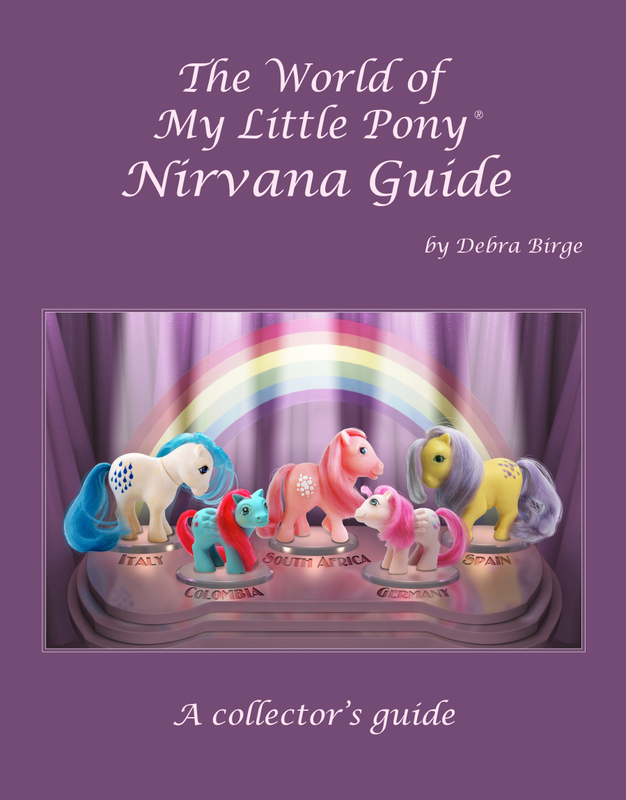 Buy All 3 of books on my website vnctoys.com! Collector's Guide Revised 2nd Edition! See Descriptions & Page Pictures Book Archive! 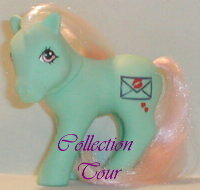 ****Ponies were first produced in 1981 through 1982 and are referred to as G1s (generation one). They weren't the rubbery vinyl type ponies we know today. They were large 10 inch tall ponies made out of hard plastic and called "My Pretty Pony." They have a trigger under their chin and when you pull it their ears flicker, tail twitches, and their eye winks. It wasn't until 1983 that the first vinyl ponies were made. The originals were a set of six called "My Little Pony Assortment"; Cotton Candy, Blue Belle, Butterscotch, Minty, Snuzzle, and Blossom. These six had flat feet, but when they were re-released as Collector Ponies later through mail offers they had caved in feet like the rest of the ponies. Hasbro then made ponies or all shapes, sizes, and colors for 10 years. They even made My Little Pony animal families! Then the year 1992 came and Hasbro released the last My little Ponies in the US of the 80s line we had come to love. These 11 different types; Sweet Kisses, Colorswirl, Sippin' Soda, Birthday Pony, Wedding Pony, Flower Fantasy, Sundazzle, Sweet Talkin', Fancy Mermaid, Paradise Baby, and Teeny Baby Twins, were made to celebrate the 10th Anniversary, and the final year, of My Little Pony. ****Then from 1997-1999 (longer over seas) Hasbro attempted to re-release My Little Ponies, but they looked totally different. They were much smaller, thinner, and were hard plastic. So, they got discontinued again due to lack of popularity. ****In late 2003 Hasbro re-released My Little Pony again, and it has been a BIG hit! They are referred to as G3s (generation 3) and are more like the 80s ponies but a bit smaller, and have their own story lines, merchandise, etc.! They are made from a similar type of material as the 80s ponies, and are styled more like the 80s ponies, but a smaller. There are also store exclusives/special with the new line! Check out your local Target, Toys R Us, Family Dollar, and KB Toys you never now what is coming next! 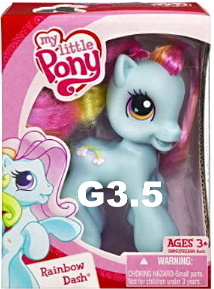 ****In 2009 despite the love if the new ponies Hasbro changed the look of My Little Pony yet again to what is referred to as G3.5, which is a shorter chubbier pony with bigger head. This bombed, with collectors, and only lasted a short time. 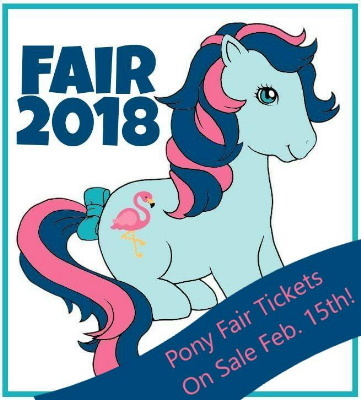 ****In 2010 Hasbro gave My Little Pony a total make over to gear them more towards animated collectors and to go along with the new TV show Friendship Is Magic which has produced a whole new generation and array of collectors and love for My Little Pony. 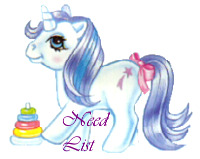 My Little Pony lovers have visited this page since 1/11/02! See how my book writing all began! Take a look at my collection! Yes, a little about me! Everything I need, that I know of!! *Brand New* Check out my printable US check list! *Brand New* Check out my printable International check list! !